Starting today, every junior and high school student across Alberta will be able to learn about the perspectives, histories and experiences of First Nations, Métis and Inuit in Canada with the help of Canadian Geographic’s Indigenous Peoples Atlas of Canada. The Alberta government has purchased 1,600 copies of the atlas to be distributed to schools throughout the province. 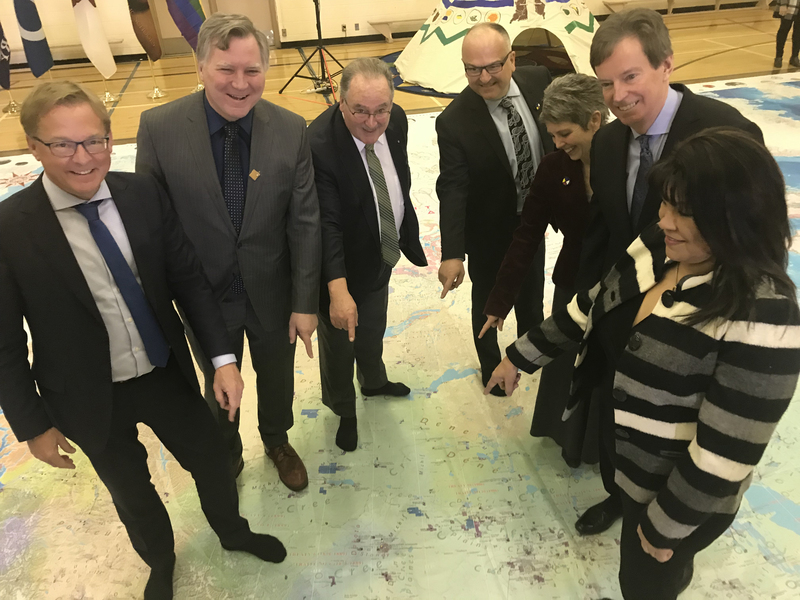 Education Minister David Eggen and Indigenous Relations Minister Richard Feehan announced the purchase during an event at Ben Calf Robe School in Edmonton. The first-of-its-kind, four-volume atlas isn’t the only resource that schools will be receiving — an accompanying teacher’s guide, which offers more than 170 pages of activities and lesson plans, as well as an interactive website and app, will also be made accessible. A companion Giant Floor Map — a map roughly half the size of a school gymnasium — without colonial provincial and territorial boundaries is also available on loan to schools across Canada free of charge through Canadian Geographic Education. The Atlas, launched last June, was produced by The Royal Canadian Geographical Society in partnership with the Assembly of First Nations, Inuit Tapiriit Kanatami, Métis National Council, the National Centre for Truth and Reconciliation and Indspire. To date, approximately 16,000 copies of the Atlas have been sold.